This post is part of my ‘This is my real life’ week. To read other posts in this series, simply scroll down past this one. Halfway through the ‘This is my real life’ week and, having shared some ideas and suggestions, I thought it was probably useful to talk explicitly about the A Life Of One’s Own philosophy. Useful, but also somewhat intimidating. This coaching practice and all the writing and everything that surrounds it has been my dream for a long time. For many years it was amorphous, nebulous, just the vaguest idea of wanting to share what I was learning about creating a life that felt truly mine and to help others in crafting theirs too. Form emerged over time, and slowly words to describe this vision. Here’s how I feel able to express it right now. 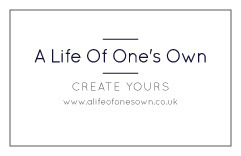 This is the A Life of One’s Own manifesto. You are enough. Exactly as you are. A Life Of One’s Own is not about ‘fixing’ something (you) that is broken. A Life Of One’s Own is not about adding something – a new skill, system, routine, discipline – to make you somehow a ‘better’ person. A Life Of One’s Own is about stripping away – peeling back the layers, the noise, the persona, the years of accumulation (physical and psychological), all the dross – until you can connect with your inner wisdom. Call it God, soul, spirit, intuition, true character, whatever. I believe we all carry within us the answers we need to live full, authentic, meaningful lives. Lives true to ourselves. Lives for us, not what someone else thinks they should be. Lives of our own. If we can drop a plumb line down to our souls then we can retrieve the wisdom, guidance and direction we need to craft lives in coherence with our true nature. This is not a one-time endeavour but an ongoing process. It’s not about having superior lives, or trying simply to ‘improve’. It’s not another stick with which to beat ourselves when we ‘fail’. It’s about finding our inner wisdom, listening to it and then taking steps to honour that. Not perfect, simply more truthful to ourselves, more authentic. A Life Of One’s Own is not an upward ladder of progress but a downward spiral of discovery. A Life Of One’s Own is about turning a dial, click, click, click, each notch shifting you closer to being in alignment with your inner wisdom. These turns of the dial could be a spiritual or philosophical shift; a change in perspective. They could be practical, from the tiniest change to the biggest. You have all the answers and the solutions; I’m here to support and encourage you in finding them. If this sounds like something that resonates with you, if it makes you go ‘Yes!’ or makes your eyes prickle with some deep knowing, then you might be interested in working with me on a one-to-one basis – and so I’ve decided to leave my 2016 coaching packages open for registration for a few more days. Take a look over here if you think we could be a good fit for your A Life Of One’s Own journey. And if that isn’t a possibility for you right now, you might want to sign up for my monthly newsletter – the form is at the top right of the page. Next > You’re the adult now. You get to make the rules.